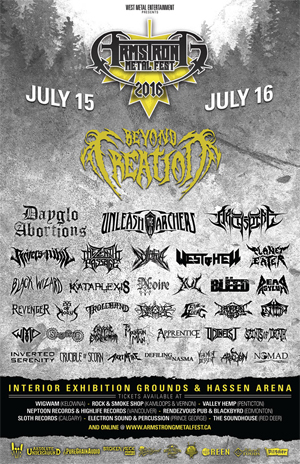 Armstrong Metal Fest is proud to announce BEYOND THE CREATION, RIVERS OF NIHIL, and THE ZENITH PASSAGE as the final additions to complete this year's 2016 line up featuring a powerhouse of bands from across Western Canada. Full line up of bands listed below with schedule of days and times to be announced at a later date. "This is going to be the best line up Armstrong Metal Fest has ever had. We have worked hard this year to make ensure the talent is front to back awesome!" comments Jesse Valstat, co-organizer of AMF.